Issuing cheques for payment of transactions that the Ministry of Education, Heritage and Arts engages in on a daily basis will now be a thing of the past. Yesterday marked a milestone for the ministry as it partnered with Australia and New Zealand (ANZ) Banking Group Limited to get more electronic transactions in place through ANZ Transactive. Being the largest ministry in the Fijian government employing more than 10,000 teachers with the biggest budget allocation of about $535 million, the ministry engages in around 150 transactions on a daily basis. More than $1billion was allocated to the Ministry in the 2018-2019 National Budget. Out of this, $535 million goes to the ministry while the rest is for various projects such as building and rebuilding schools. The transactive payment agreement with ANZ utilises the use of an integrated, web-based cash management platform that will allow the ministry to transact seamlessly and efficiently. The Attorney-General and Minister for Education Aiyaz Sayed-Khaiyum said the Education ministry was engaged with paying suppliers for various materials, paying Rural Service Licence (RSL) providers, giving grants to schools and high education institutions including transfer allowance, rural maritime allowance, travel allowance paid to teachers which all came under the ambit of the ministry. “What we have found unfortunately is that a number of transactions that the Ministry of Education does engage with on a daily basis is payments made by way of cheques,” Mr Sayed-Khaiyum said. He mentioned that the ministry also looks after grants that were given to tertiary institutions amounting to over $100 million. 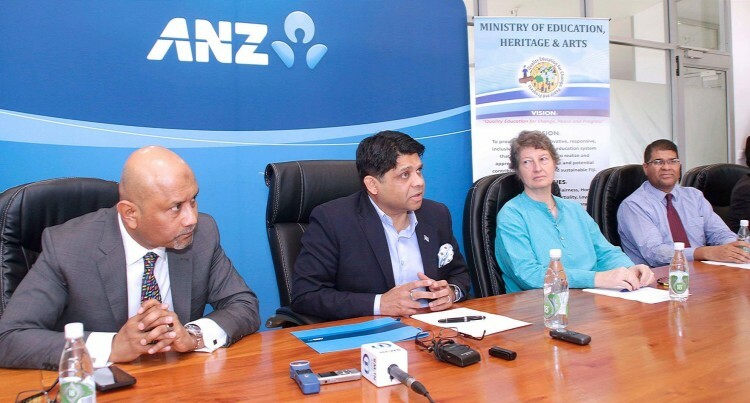 “In order to bring the Ministry of Education into the 21st century as far as the transactions are concerned we have now partnered with ANZ so we will have electronic transactions take place for the payment called transactive payment,” said Mr Sayed-Khaiyum. Permanent Secretary Alison Burchell said the ministry was looking forward to promoting the financial inclusion component of the agreement and perhaps extend it to include students in tertiary and higher education institutions in future. “Efficiency is really key as we move forward,” she said. “It is all about service delivery and within that context we have discovered that quite a lot of cheques that we are issuing for example becomes stale quite often and that means another cheque being issued. ANZ Fiji Country Head Saud Minam said writing cheques was a the thing of the past as we moved to a digital era. He thanked the Government for basing their confidence and trust in ANZ who have been part of the country for the past 137 years. Mr Minam commended the education ministry for embracing the transactive system, which was launched a number of years back and which was already in use by the Ministry of Economy. He also acknowledged the Reserve Bank of Fiji and its Governor, Ariff Ali, who supported the bank in their move to digital transactions. “It is one of the safest and easiest modes of transaction today. It does have all the safety and security features in it,” Mr Minam said. Transactive comes with a token which has moving digital numbers meaning the same number will not be repeated, that provides the safety of the transaction. “There are about 33,000 transactions being done from the government with the 17 different ministries so far we only have a couple of them on board with transactive and we got a long way to go,” he said. RBF Governor Mr Ali congratulated ANZ and the ministry for their partnership.